A stable and secure IT environment is critical to productivity! 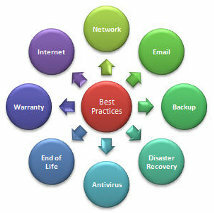 We don’t pretend to know what is best for you and your company, but we do know that implementing "IT best practices" results in a stable and secure IT environment. It is our experience that IT stability and security allow your staff to become more productive — ultimately resulting in increased profitability. Our Best Practice Assessment is designed to compare your current IT environment and support model against industry standard IT best practices. We take a look at all aspects of your environment and provide you with recommendations for improvement. Our recommendations document provides an overview of each of these areas and whether or not it meets "IT best practices."